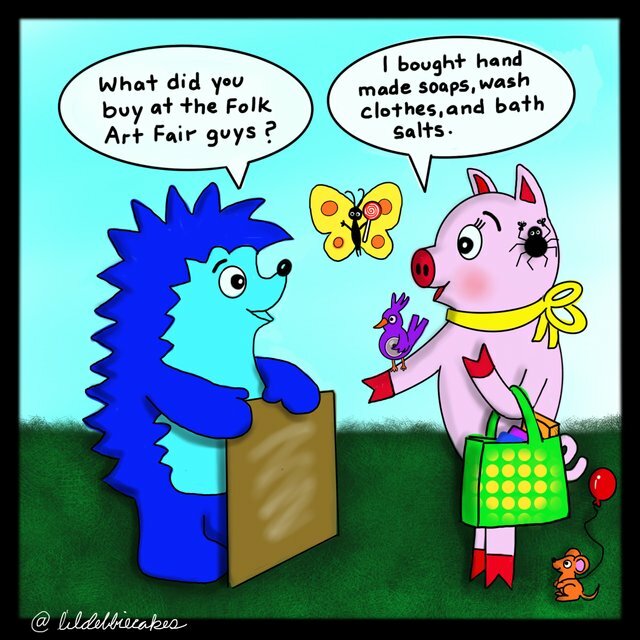 Do you like the quirky humor of our piglet Pinky and hedgehog Spiky? Can you relate with the screw-ups of Spiky? Or perhaps you have something in common with the order-loving Pinky? Or maybe you like their pets - Cornelius the purple cardinal, Dietrich the mouse, Victor the spider and Betsy the butterfly? They sure add lots of fun to the situations. 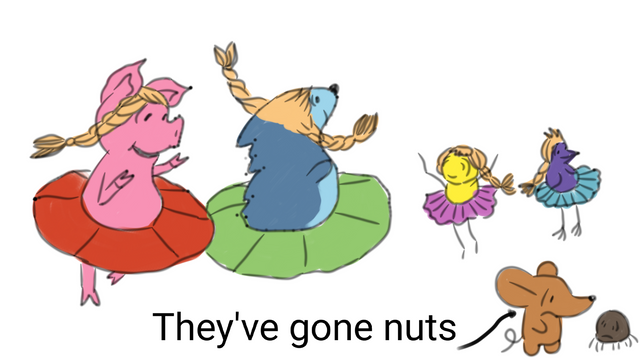 Here's the thing: my wife Ausra - @laputis and I invite you to join in a contest to draw our beloved imaginary friends and win some STEEM. Are you an experienced artist? You can participate easily. Are you a beginner like us? No problem. This contest is open to every humor-loving Steemian. Could be a silent comic too - without words. 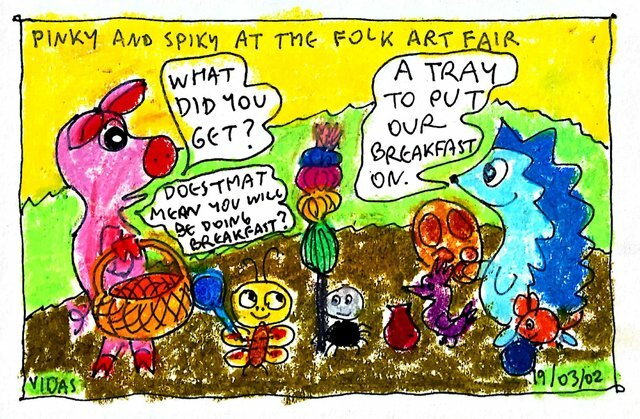 @laputis and I went to the folk art fair last weekend where thousands of people sell their crafts and folk art and various other home made goods, including food. Will you come up with some exciting and funny comic strip about this? I'm sure you will. 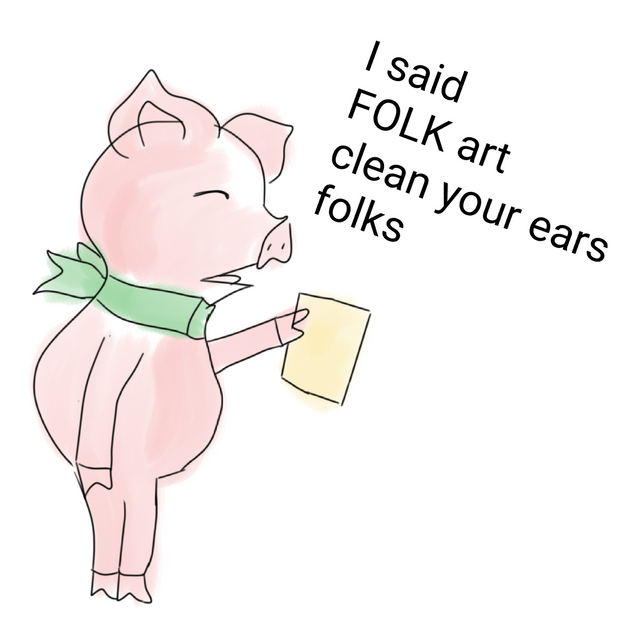 Because @laputis and I don't keep SBD or STEEM raised from our own posts to ourselves but rather donate to support not only this contest, but also @deemarshall 's contests, we hope Pinky and Spiky fans will understand the importance of our self-votes too. This way everybody wins - not only we can afford bigger prize pool but also bigger donations. The way we see it, it's not a self-vote at all - it's our way to help grow Steemit artist community. Oh and by the way, even if we get more Steem Power from our posts, this also means larger upvotes for contest participants. Then the whole game is an endless cycle of giving and receiving. And then we all grow together faster... Isn't this what life is all about? This week we will choose the winners ourselves. We will pick winners based on what us laugh the most. 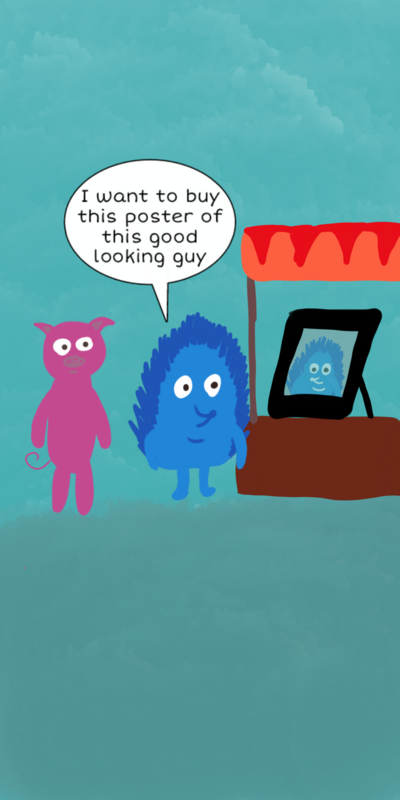 We will also take into consideration the quality of the comic strip as well - how well it is drawn. However, humor is the most important thing here because when we start drawing, our technique and style isn't at the level of an artist with 10000+ hours of experience. Our goal here is to support the community while inspiring to create some amazing art and add more laughter to everyone's day. 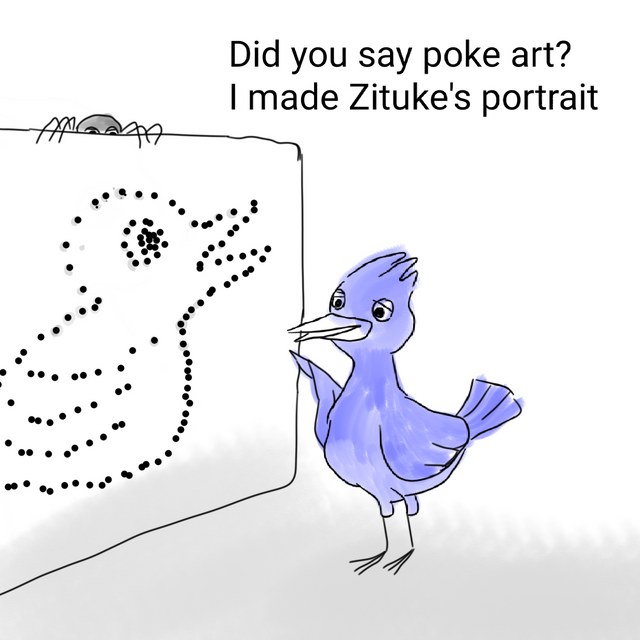 Support our fellow contestants - upvote, resteem and comment their entry to let them know specifically what did you appreciate about their drawing. Also stay tuned for the post about winners from Week 49! We hope to see even more entries next week! 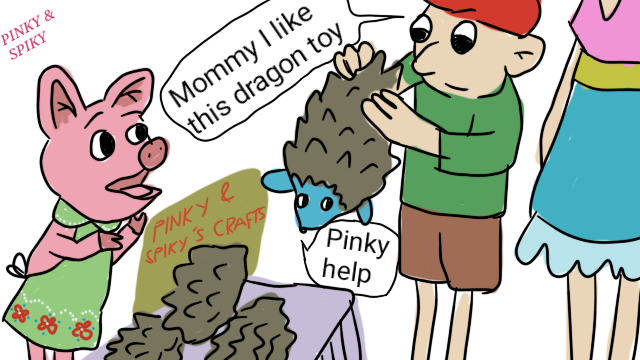 And now go wild with Pinky and Spiky! Did you know Steem Basic Income has a Quality Policy? @organduo, Your art hold the Uniqueness and Simplicity, these two tools can communicate with any body for sure and in my opinion your art always communicate with viewers in fun way. Stay blessed. Welcome and fun to hear that. Enjoy. Pinky and spiky want energy through the breakfast. Here is everyone busy in breakfast planning. When you don't know the language. It's hard to translate comic books. If you are not difficult please write a small explanation text. Although this also has a plus. Your UA account score is currently 3.744 which ranks you at #5073 across all Steem accounts. Your rank has improved 18 places in the last three days (old rank 5091). In our last Algorithmic Curation Round, consisting of 219 contributions, your post is ranked at #41.